We have pizza night about once a week, but instead of making a typical pizza, we decided to make Pizza Muffin Bites instead. I have to say, pizza is one of my very favorite foods. Delicious muffin pizza bites filled with sauce, cheese, and mini pepperoni. With all of the toppings, it is so versatile and everyone can enjoy their own customized version. For instance, I enjoy thin crust pizza with pepperoni, cheese and sausage. However, my husband enjoys thick crust pizza topped with cheese, green peppers, onions and jalapenos. Splitting toppings on a pizza isn’t a problem. But making a crust that satisfies both the thin and thick crust lovers is a tad difficult. So when it comes to pizza night we compromise. 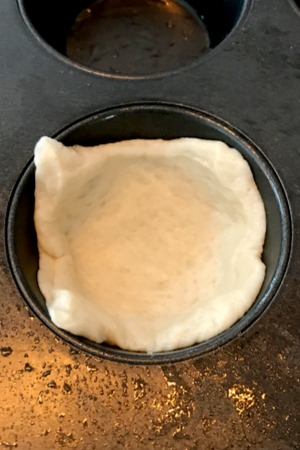 You can use your own pizza dough, but refrigerated pizza dough makes this pizza muffin bites recipe quick and easy. One week we will have thin crust, and the next thick crust. But I always prefer to make homemade pizza whenever we can. This way we can agree on how thick to roll out the dough to make us both happy. I love pizza as much, or more, as the next person. However, sometimes you get in a rut and need to mix things up. Yes, of course you can switch up your pizza toppings. Or you can even order from a different pizza shop. But when I mean I need to mix it up, I mean not having traditional pizza at all. Form the dough in each muffin tin. It is okay if it doesn’t fit perfectly. I still want to enjoy the flavor of pizza, but in a little different way. This is when I turn to my pizza casserole recipe. Everyone in our family can agree that pizza casserole is one of their very favorite weeknight, or pizza night, meals. It’s quick, easy, and even the pickiest eater loves it. Place the sauce and any pizza toppings in the dough. The cheese will come later. Pasta noodles are smothered in pizza sauce and topped with pepperoni and cheese. Then it is baked until hot, browned and bubbly. It doesn’t get much better, or easier than that! But when it is time to make something for a pizza themed party, pizza casserole isn’t on the top of my list. In a party setting, nobody wants extra dishes to provide or clean. Instead, I prefer to serve finger foods to make life much easier. After 15 minutes of baking, it’s time to add the cheese. Yes, pizza in its traditional form is technically a finger food. Although there are some folks that eat it with a fork and knife, it is socially acceptable to pick up a piece of pizza with your hands. But depending how it is sliced, it can get quite messy. So when I was asked to bring an appetizer to party that several children would be attending, I knew that I had to make my muffin pizza bites. Muffin pizza bites are individual mini-pizzas that are made inside standard muffin tins. They are made of little cups of pizza dough and are filled with whatever toppings that you prefer. 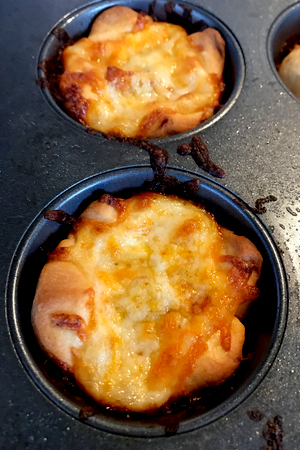 Once the cheese is brown and bubbly, the pizza muffin bites are done. For this occasion, I made several that were cheese only and others that were topped with pepperoni. However, when hosting my own party for children, I let them ‘build their own’ pizza as part of the process. Typically each one of my 12 muffin tins are filled with some unique combination. The key here is to write down on a piece of paper which child made which pizza muffin bite. That way every gets exactly what they wanted. 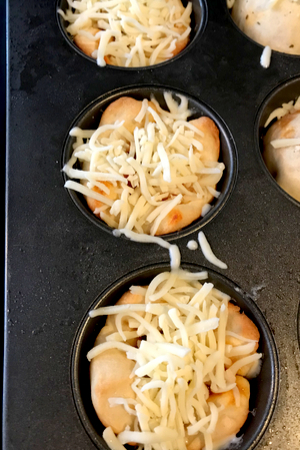 Just in case you were wondering, these pizza muffin bites aren’t just for kids. 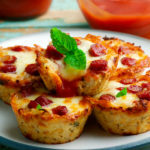 Serve pizza muffin bites with marinara – absolutely delicious! My entire family begs me to make these not only for pizza night but also for every party that we have. They have been brought to birthday parties, graduation parties, and family holiday celebrations. But it seems that most often, they are requested during football season. 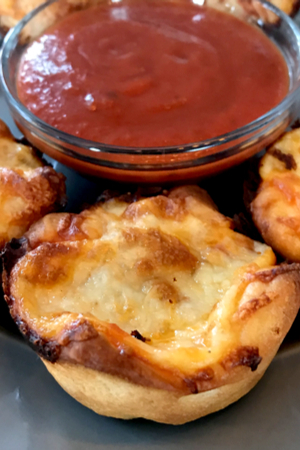 Whether it be a big Superbowl party or a local high school tailgate, both my family and friends beg me to make my pizza muffin bites recipe every time. If you like pizza in general, check out our other healthy, and not so healthy pizza based recipes below. 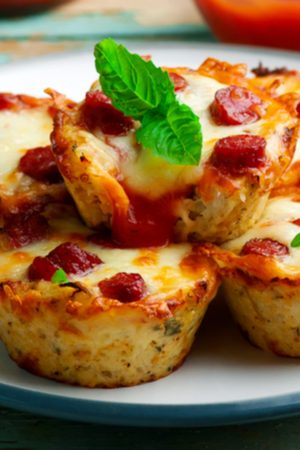 All the flavor of your favorite pizza packed into a muffin tin. Perfect appetizer for game day, casual party, or snack. Grease a 12-cup muffin tin with non-stick cooking spray. Unroll the refrigerated pizza crust and slice in 12 even sections using a pizza cutter. 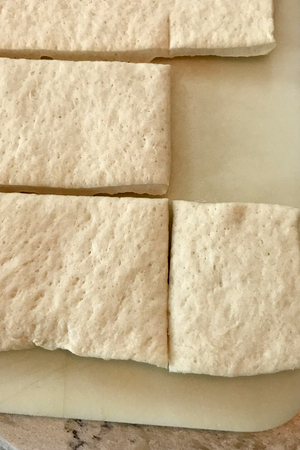 Take one piece of the dough and flatten out in the palm of your hand. Press the dough into a muffin cup, pressing it up the sides as much as you can. Repeat until each muffin tin is filled with dough, set aside. In a small bowl, combine the melted butter, garlic salt and Italian seasoning. Using a pastry brush, spread the butter mixture over the dough. 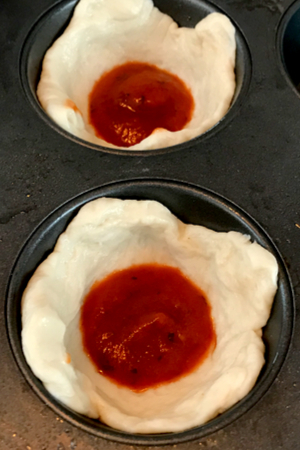 Put 1-2 tablespoons of pizza sauce into each dough cup. *If the dough slides down the sides, adjust as necessary. Sprinkle your pizza toppings, except the cheese. Bake the pizza muffins for 15 minutes. Add 1-2 tablespoons of cheese on top of each pizza muffin and continue to bake for 10 minutes or until the cheese is browned and bubbly.